A year later and it’s time for me to enter the Mixology Monday fun yet again. When I read the prompt from A World of Drinks’ site, I immediately thought of that jar of red pepper jelly that my wife bought a couple months ago. After all, no one was actually going to eat that stuff. Probably why it was on sale in the first place. But a drink? That sounded perfect. The red pepper jelly is not overly sweet and not overly gelatinous. It’s smoky, too, with just a hint of spice. I wanted to accentuate the smokiness by adding a smoky scotch, but I am fresh out of Islay scotches, so I settled for the Jonnie Walker Double Black, which is actually pretty smoky. Not quite like a Laphroig or anything, but it has some peaty heft to it. Ginger would work well with the spiciness, too. and strain into a cocktail glass. Garnish with a brandied or bourbon cherry. If you can’t guess, the name comes from smoke signals, because that’s what the drink reminds me of. It’s refreshing with a smoky complexity and hints of sweet and sour. Not all of you have a jar of red pepper jelly sitting in your fridge, so you won’t be making a Signals cocktail. But if you do, or if you see a jar of it on sale, try it. It’s a smoky sweet and sour that’s easy to drink and makes people take notice. After all, how often do you have a smoky sweet and sour? Thanks to A World of Drinks for hosting this month’s Mixology Monday! Looks and sounds delicious! I love Domaine de Canton and it’s always nice to see a savoury preserve in play! Hi Chad! Your cocktail looks great. 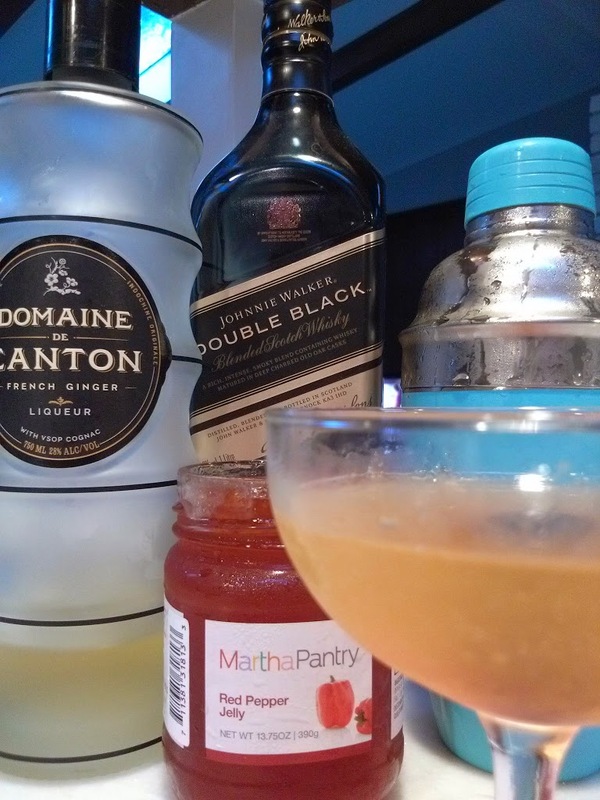 I love the idea of using pepper jelly in a beverage. Thank you for inspiring me.